Background: Inflammatory Bowel Disease (IBD) is the hypernym of a group of chronic inflammatory relapsing gastrointestinal diseases which consist of ulcerative colitis (UC) and Crohn's disease. Although its etiology is ambiguous; it is marked by the dysregulated production of proinflammatory mediators like tumor necrosis factor (TNF)-α and interleukins (IL) etc. These accelerated inflammatory responses are triggered by various environmental and genetic factors. They significantly pose an adverse impact on patient’s life and treatment of IBD requires long-term therapy. 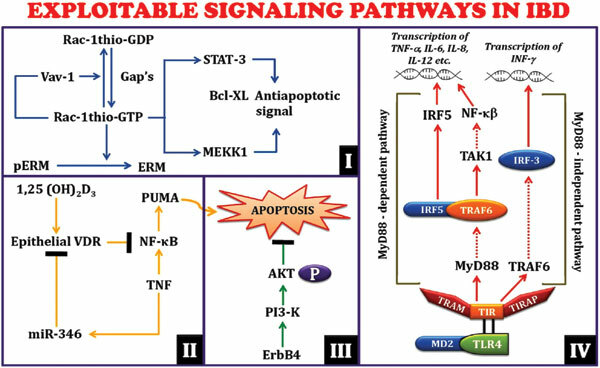 Various signaling pathways which are mediated by different cytokines like IL-6, IL-17, IL-22, IL-31, IL-33, TNF and NF-kb etc. are responsible for the accelerated immune responses in IBD. Objective: In this review numerous signaling pathways like TL1ADR3, TLR, ErbB, VDR, TGF-β1 Smad 3, Rac1 GTPase and PI3KAKTPTEN which are of clinical importance for IBD have been elucidated with a particular emphasis on JAK-STAT pathway. Conclusion: An exhaustive study of the above mentioned signaling pathways and their influence on the inflammatory process in IBD may simplify the expertise in the homeostasis of gastrointestinal tract and aid in unveiling new avenues for the treatment of IBD. IBD, JAK-STAT, (TNF)-α, signaling, cytokines, homeostasis.